The <error> element of the <httpErrors> collection adds a unique error mapping to the HTTP errors collection. IIS 10.0 The <error> element was not modified in IIS 10.0. IIS 8.5 The <error> element was not modified in IIS 8.5. IIS 8.0 The <error> element was not modified in IIS 8.0. IIS 7.5 The <error> element was not modified in IIS 7.5. IIS 7.0 The <error> element of the <httpErrors> collection was introduced in IIS 7.0. IIS 6.0 The <httpErrors> collection replaces the IIS 6.0 HttpErrors section of the IIsWebService metabase object. The <error> element of the <httpErrors> collection is included in the default installation of IIS 7. 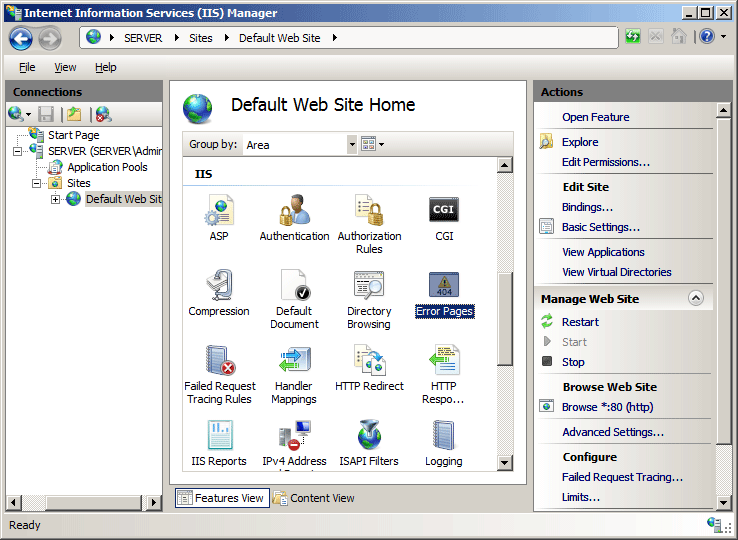 In the Connections pane, expand the server name, expand Sites, and then navigate to the Web site or application that you want to configure custom error pages for. In the Home pane, double-click Error Pages. Select Insert content from static file into the error response to serve static content, for example, an .html file, for the custom error. Select Execute a URL on this site to serve dynamic content, for example, an .asp file for the custom error. 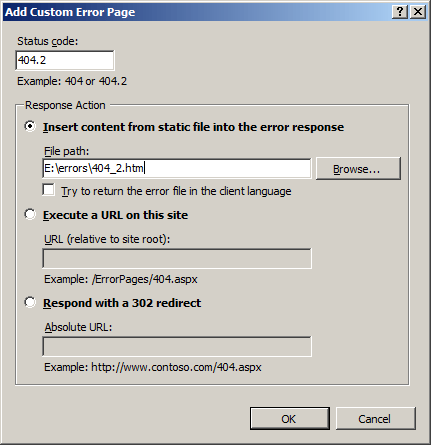 Select Respond with a 302 redirect to redirect client browsers to a different URL that contains the custom error file. 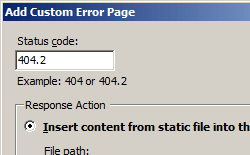 In the File path text box, type the path of the custom error page if you chose Insert content from static file into the error response or the URL of the custom error page if you use either the Execute a URL on this site or Respond with a 302 redirect, and then click OK. If you select Execute a URL on this site , the path must be a relative path. If you select Respond with a 302 redirect , the URL must be an absolute URL. Specifies the file path or URL that is served in response to the HTTP error specified by the statusCode and subStatusCode attributes. If you choose the File response mode, you specify the path of the custom error page. If you choose the ExecuteURL response mode, the path has to be a server relative URL (for example, /404.htm). If you choose the Redirect response mode, you have to enter an absolute URL (for example, www.contoso.com/404.htm). Specifies the initial path segment when generating the path for a custom error. This segment appears before the language-specific portion of the custom error path. For example, in the path C:\Inetpub\Custerr\en-us\404.htm, C:\Inetpub\Custerr is the prefixLanguageFilePath. Specifies how custom error content is returned. The responseMode attribute can be one of the following possible values. The default is File. Serves static content, for example, a .html file for the custom error. If responseMode is set to File, the path attribute value has to be a file path. Serves dynamic content (for example, an .asp file) specified in the path attribute for the custom error. If responseMode is set to ExecuteURL, the path value has to be a server relative URL. 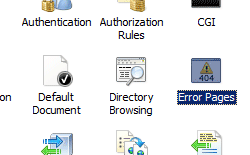 Redirects client browsers to a the URL specified in the path attribute that contains the custom error file. If responseMode is set to Redirect, the path value has to be an absolute URL. Specifies the number of the HTTP status code for which you want to create a custom error message. Acceptable values are in the range from 400 through 999. Specifies the number of the HTTP substatus code for which you want to create a custom error message. Acceptable values are in the range from -1 through 999. The following configuration example, when included in the Web.config file for a Web site or application, uses the errorMode attribute to only allow detailed error messages to appear on the local computer. It also uses the defaultResponseMode attribute to set the response mode for the site or application. The sample then removes the inherited error message for the 500 status code. Next, it sets the prefixLanguageFilePath attribute to the directory where IIS should search of a new custom error page, and sets the path attribute to 500.htm, the file that contains the custom error message. The following examples adds a new file for all status code 404 errors with a substatus of 5, which IIS returns for "URL Sequence Denied" errors. In these examples, the prefix path is set to "%SystemDrive%\inetpub\custerr", and the file name is specified as "404.5.htm".